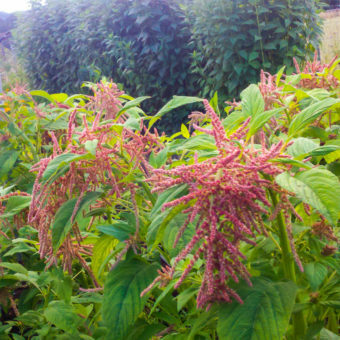 Amaranthus cruentus. Flower. 70 days. Oeschberg is an amazing deep purple-red amaranth that is darker than Love Lies Bleeding, but with an upright growth habit. Seed heads are very highly branched and hold their color longer than other varieties, making it great for flower arrangements. 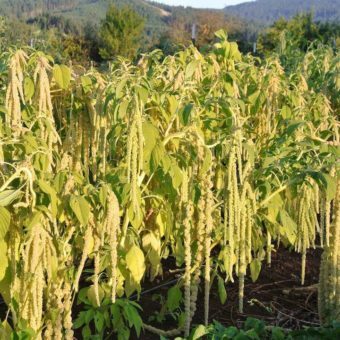 Plants are a bit short for an upright amaranth at 4′ tall, which is great in the garden as they won’t shade out everything else. Leaves are edible and a good heat resistant salad green when young – red color develops early. Black seeds are not recommended as grain. May self-seed. Can be succession-sown until the end of July for late-season flower production. Sow in pots indoors in April for planting out in May, or direct sow after danger of frost. Space or thin to 12–18 in. Harvest for grain when seeds rub off easily in your hand, but before seedhead is crispy dry. Hang over a tarp to dry for several days, then dance, rub, or flail seeds from seedheads. Winnow to clean or place seeds in a bowl and make stirring motion with your arm; chaff rises to the top for easy removal. Isolate from other amaranths by 1/4 mile.